Yes, the Knicks were off on Monday, but I wonder how much their key guys will have left in the tank for Tuesday's game considering the Knicks and Hawks played a four-overtime epic on Sunday, a 142-139 Atlanta win. It was the first four-OT game since Bulls-Pistons in 2015 and only the 11th quadruple-OT game in NBA history. It was New York's first since 1951 against the Rochester Royals. Four Knicks fouled out: Carmelo Anthony, Kristaps Porzingis, Joakim Noah and Kyle O'Quinn. Anthony played 46 minutes and finished with 45 points, his first 40-point game since November 2014. Might be his last with the Knicks, too, considering all those trade rumors linking Melo to the Clippers. Brandon Jennings played 53 minutes and Courtney Lee 52. Atlanta's Paul Millsap played a ridiculous 60 minutes. First of an NBA TV doubleheader. New York lost to Atlanta without Derrick Rose, who sprained his ankle in Friday night's win over Charlotte. He likely won't play here, either. Jennings had 18 points as the fill-in starter for Rose. Washington has won four straight and eight of nine following a 107-94 victory in New Orleans on Sunday. John Wall had 18 points and 19 assists and Bradley Beal 27 points. The Wizards had been 0-5 at Western Conference teams in 2016-17. 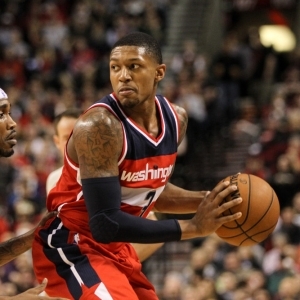 The Wizards have won two high-scoring games vs. the Knicks this season. Key trends: The favorite is 4-0 against the spread in the past four meetings. The "over/under" is 15-7 in Washington's past 22 after a win. New Orleans completed a six-game homestand on Sunday at 3-3 with a 107-94 loss to Washington. Anthony Davis had 36 points, 17 rebounds, three steals and two blocked shots, and Jrue Holiday 26 points and 11 assists. The Pelicans rallied from 18 down to lead briefly but then ran out of gas. Toronto lost for the sixth time in seven games Sunday, 114-113 at home to Orlando. Kyle Lowry had 33 points, eight assists and five rebounds, while DeMar DeRozan, Toronto's leading scorer, returned to the lineup after missing three games with a sprained right ankle and had 22 points, seven rebounds and six assists. The Raptors had won seven straight at home in the series. First meeting of the season between New Orleans and Toronto, which won both last season. Key trends: The Pelicans are 2-10-1 ATS in the past 13 meetings. The under is 5-2 in Toronto's past seven. Sacramento was in Philadelphia on Monday. This concludes the Kings' season-long eight-game road trip. I thus give them almost no chance here. Houston completed a five-game road trip at 2-3 following a 120-101 loss at Indiana on Sunday. James Harden was vastly outplayed by Paul George with Harden going 3-for-17 from the field and 2-for-10 on 3-pointers for 15 points along with five rebounds, eight assists and eight turnovers. Five of the Rockets' last seven losses have come by 10 or more points. Houston has won 10 of the past 11 meetings vs. Sacramento and six in a row at home. Key trends: The home team is 4-1 ATS in the past five meetings. The over is 6-2 in the previous eight. Oklahoma City's three-game winning streak ended in a 107-91 loss in Cleveland on Sunday. Russell Westbrook finished with 20 points, 12 rebounds and 10 assists for his 24th triple-double, but shot only 7-for-26. That was OKC's first game without very important sixth man Enes Kanter, who broke his right forearm like an idiot Thursday when slamming it on a chair on the bench. San Antonio is on only its second two-game skid of the season after being surprised 105-101 at home by Dallas on Sunday. Kawhi Leonard had 24 points for San Antonio, which fell to 16-6 at home after tying the league mark with a 40-1 record last season. First meeting between OKC and San Antonio. The teams split four in 2015-16. The Spurs have taken the past three at home. Key trends: The Thunder are 8-2 ATS in the past 10 meetings. The under is 4-1 in the past five in OKC. Second NBA TV game. Charlotte dropped a fourth in a row Saturday, 109-106 to Sacramento. Frank Kaminsky air-balled a 3-pointer with a second remaining. Kemba Walker had a 20-point third quarter but was held scoreless in the fourth. Portland's three-game winning streak ended in a 113-111 home loss to the Warriors -- who were without Steph Curry -- on Sunday. Evan Turner missed a potential winning 3-pointer in the final seconds. CJ McCollum had 25 points. Damian Lillard had 19 and reached 8,000 career points, becoming the 11th Blazer to hit the mark and joining Michael Jordan and LeBron James as the last three players to reach 8,000 points and 2,000 assists in their first five seasons. Charlotte defeated Portland, 107-85, on Jan. 18, but Portland has won eight consecutive home games against the Hornets. Key trends: The Hornets are 1-7 ATS in their past eight in Portland. The under is 9-4 in the Blazers' past 13 at home. Denver has become an offensive juggernaut and has won seven of nine. The Nuggets completed a home-and-home sweep of Phoenix 123-112 on Saturday despite playing without emerging star center Nikola Jokic. He hurt his hip Thursday and won't play here, either. Danilo Gallinari scored 32 points and Kenneth Faried had 21 points and 13 rebounds for the Nuggets on Saturday. Emmanuel Mudiay missed a fourth game in a row and he's doubtful here. Los Angeles lost its third consecutive Thursday, 96-88 in Utah. Lou Williams scored a team-high 20 off the bench while both Jordan Clarkson and Ivica Zubac added 16. Julius Randle was out with an illness and D'Angelo Russell a third straight game with an MCL and calf sprain. Randle should at least be back here. Denver won the first meeting 127-121 on Jan. 17 and has taken the past three in the series. Key trends: The Nuggets are 7-0 ATS in their past seven at the Lakers. The over is 3-0-1 in the past four there. Early lean: Wait on the two Lakers.